I learnt this Tirunelveli style idli sambar from my mom. Most of us make idli sambar with toor dal. But my mom makes sambar by combining moong dal and toor dal and with freshly roasted and ground Nellai style idli sambar powder ( my mom calls this as mel podi in Tamil). Last week I prepared this as a side dish for idli. My husband liked it so much. Many thanks to my mom. 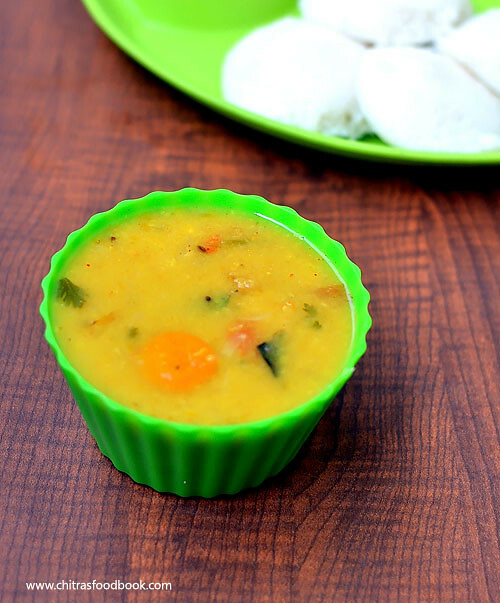 .Lets see how to make Tirunelveli style Idli sambar with toor dal and moong dal. If you are looking for Tirunelveli sambar for rice, do check this link . To make Tirunelveli style idli sambar powder : Roast all the items given under “To roast and grind” adding 1/2 tsp of oil till nice aroma arises. Make a smooth powder by grinding it. Use this powder to make sambar. Just add 2 tsp of this powder at the end. This gives the flavor. Keep this powder ready before doing this sambar. You can store this powder and use later. Cube cut the vegetables .Chop the tomato into pieces.Soak the tamarind in water. Pressure cook moong and toor dal by adding water,turmeric powder and a drop of oil. In a small box, keep the chopped vegetables and cook with dal. Cook for 1-2 whistles depending on your cooker. If you don’t want to follow this,cook the veggies and dal separately. Extract the juice from soaked tamarind. Keep aside. Now heat a kadai with 1 tbsp of oil and add mustard seeds. Let it pop. Then add urad dal, pinched red chilly and curry leaves. Add onion, green chillies, tomato pieces and saute until tomato turns mushy. Now add the tamarind juice, cooked dal and boiled veggies along with onions, tomato & green chillies. Add a pinch of hing. Add the required salt and water. Let it boil for sometime. Now add 2 tsp of freshly ground powder and boil for 2 mins. Lastly add the diluted besan flour and boil for few minutes. Garnish with coriander leaves. Serve with idly by adding sesame/gingely oil. Enjoy ! 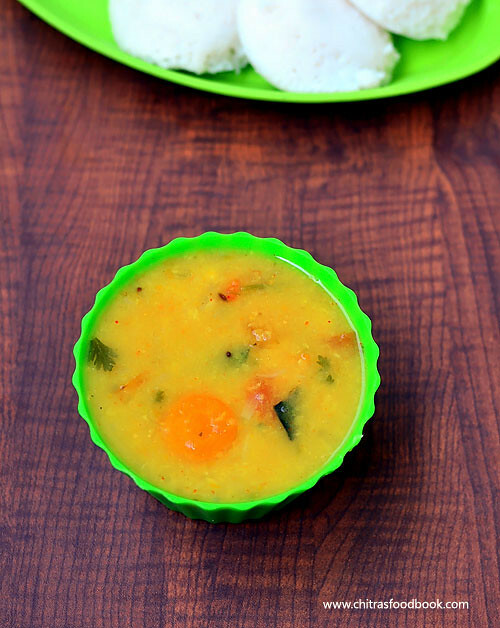 This sambar is a combination of moong and toor dal.So it tastes different and yummy. Do try it ! 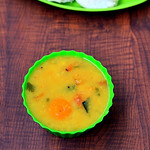 The first picture of the sambhar is eye catchy! Will try adding thoor dal some time! woowe tasty sambar... that too floated veggies on the top looks gorgeous. Have never tried moong and toor together in making sambhar. looks nice. this looks mouthwatering.. am going to try for sure. Great looking sambar......reminds me of the Shanti Sagar ones. looks so mouthwatering, love sambhar dipped idlis! wow! it looks perfect and tempting chitra! This looks really delicious! Thank you for a nice comment on my site. You have great recipes. tried tis sambar today...super a irunchu tanQ fr d recipe..